iderdider....: that john denver was not full of crap. The Rockies were exquisite. 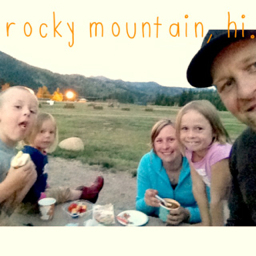 I have so much to report after nearly 2 weeks of mini RVing with these 4. We saw friends, played with cousins and consumed a lot of chili. Note: in the above photo, I am eating chili. It is wonderful to be home. best heading yet! so glad you are home!